Location assumed based on DOT map and large cedars found at the site. From the Hancock County Courthouse, go southeast on Hwy 15 for 2.2 miles to where Shoal Rd turns off to the left. Follow Shoal Rd for 3.5 miles to Bethel Church Rd on the left and Well Rd (closed) on the right. Walk right (south) on Well Rd for 0.5 mile. The cemetery is located behind the fence on your left (to the east) and is most likely at the large cedars approximately 200 feet from Wells road. There are no marked graves. The cemetery is shown on the DOT map at approximately this location, although the map suggests it may be as much as 0.3 mile to the south of this point. 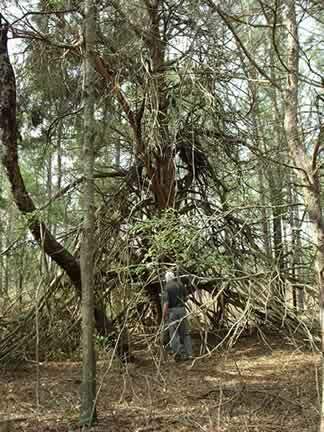 However, the enormous cedar and the rise on which it stands provide strong evidence that this may be a cemetery. The area surrounding this point has been heavily logged and disturbed, whereas the cedar has been growing for many years. A fieldstone may mark a grave. Cemetery location not confirmed.